Combining a strong traditional mathematics major with opportunities for student research, a very successful secondary education program, and preparation in applied mathematics and statistics, the Department of Mathematics is committed to helping each Geneseo student achieve their goals, both before and after Geneseo. All overloads of multi-section courses must go through the Math Department. Contact the department secretary (peckt@geneseo.edu) if you have any questions. If a course is filled to capacity, students are encouraged to take other math courses needed in the major. Overload requests will be considered based on highest need. If other sections of the same course are still open, no overloads will be considered. If classes are currently at their capacity and a student is deemed to have time to take a course in a later semester, their request will be denied. 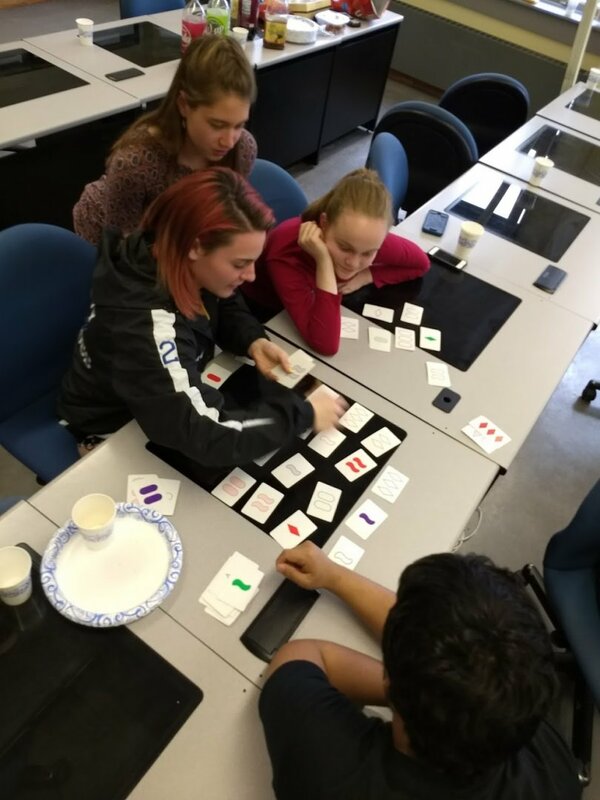 American Statistical Association (ASA)'s DataFest is a celebration of data in which undergraduate teams work around the clock to find and share meaning in a large, rich, and complex data set during a weekend. This year, four Geneseo students took part as a team in the DataFest at RIT. 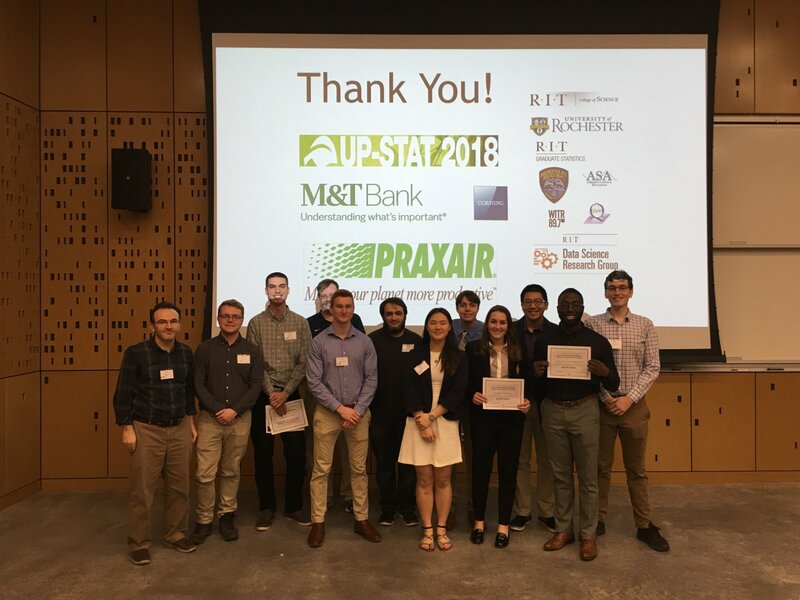 The team brought the second place award to Geneseo among other seven competitive teams in the category of Best in Show/Insights, mostly statistics or data science majors from RIT and UR participated. Only two teams got awards in this category. One of them is Geneseo's team, Newton's Knights, included four students, Ian Costley (Math/Physics), George Kuliner (Math/Economics), Tolulope Olatunbosun (Math), Salvador Galarza (Applied Math) and Isaac Burmingham (Physics). 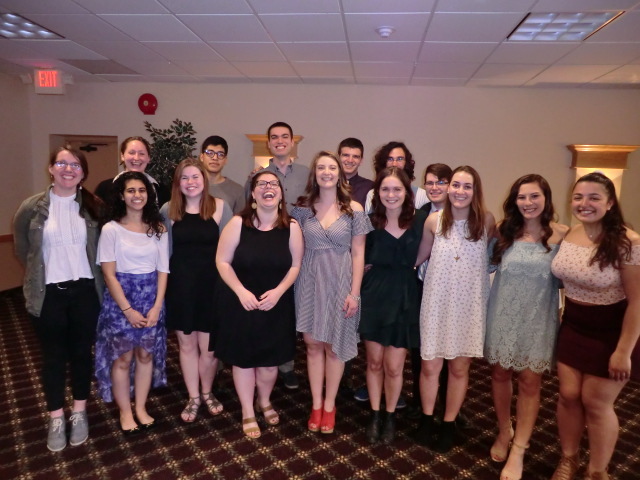 The annual Geneseo Math Research Weekend was held Feb 1 - 2, 2019, and was led by Dr. Elizabeth Cherry from RIT. This year's topic was on the Nonlinear Dynamics of the Heart. Congrats to all students who participated! On Tuesday, April 24, 2018, we welcomed students from Honeoye Central School and Livonia Central School for a Math Circle event. We played some mathematical games and discussed the strategy behind them (or lack thereof!). President Greg Vinal and Vice President Gabrielle Angeloro of our PRISM club were helpful to students. Dr. Ahmad Almomani gave a short talk about the Fifteen puzzle. A good time was had by all. The UPSTAT Conference is a regional conference of the American Statistical Association (ASA) in Statistics and Data Science. Geneseo Math students (6 teams) presented their capstone projects in Probability, Statistics, Machine Learning, and Stochastic Modeling. 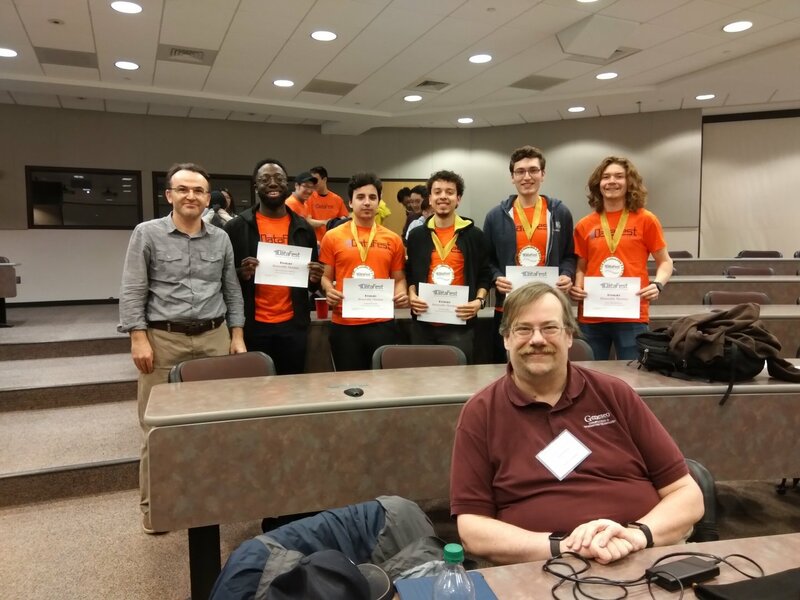 Three Geneseo teams won awards (two bronzes and one honorable) on the Computation and Applications category, in which a total of 20 teams from other regional colleges and universities were evaluated and only six teams received awards. Geneseo students presented a variety of topics including "Integrating machine learning (ML) algorithms and statistical methodology to predict college graduation status and final GPA", "Kaggle experience: Humpback whale image identification", "Emotion recognition using deep learning", "Predicting a quasar’s redshift and radio brightness with ML algorithms", and "Modeling stock prices using Fractional Brownian Motion and ML algorithms". 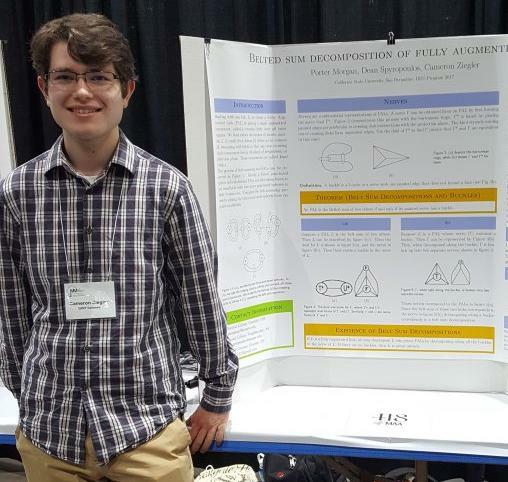 Cameron Ziegler (2018) attended the 2018 Joint Mathematics Meetings and won an Outstanding Poster award. Cameron's research poster was on Belted Sum Decomposition of Fully Augmented Links and the research was performed at CSU San Bernardino. Congrats Cameron! 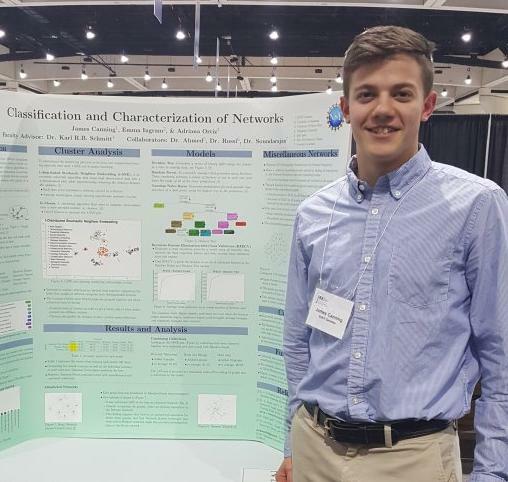 James Canning (2020) attended the 2018 Joint Mathematics Meetings and won an Outstanding Poster award. James' research poster was on the Classification and Characterization of Networks and the research was performed at Valparaiso University. Congrats James! BethAnna Jones (2019) and Gabby Angeloro (2018) attended the 20th Annual Nebraska Conference for Undergraduate Women in Mathematics (NCUWM) in January 2018. 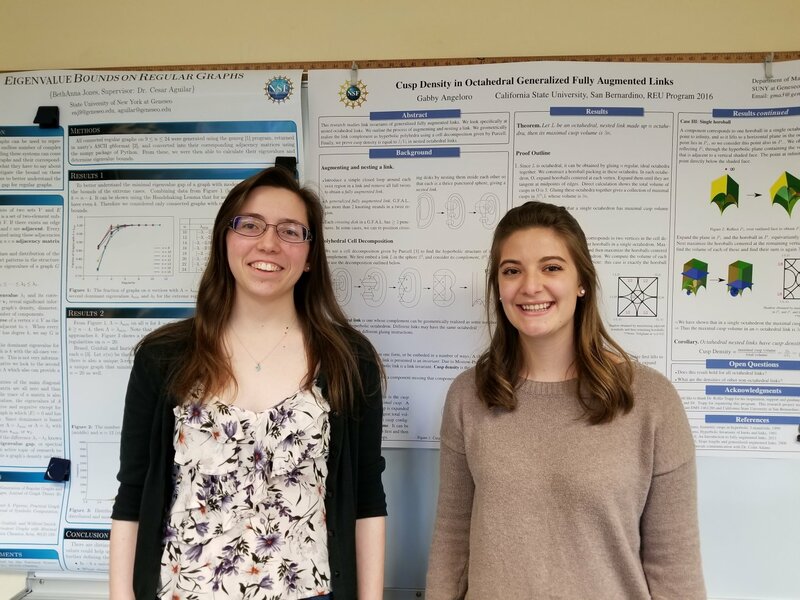 BethAnna presented her research on eigenvalue bounds of regular graphs and Gabby presented her work on link invariants of generalized fully augmented links. Professor Emeritus Ed Wallace was recently inducted into the NYS Math Educators Hall of Fame. Professor Wallace was a past president of the AMTNYS, former AMTNYS Journal Editor, and recipient of the prestigious SUNY Chancellor's Award for Excellence in Teaching. Congratulations Professor Wallace! Gary Towsley, distinguished teaching professor of mathematics, is among the country's top undergraduate professors named in The Princeton Review's new guidebook "The Best 300 Professors." "To be honest, I'm not surprised to hear about Gary's selection as one of the country's best," said Provost Carol Long. "His reputation as a consummate scholar is well-known on our campus, and I frequently hear from students about the impact he has on their learning, both inside and outside of the classroom." In its profile of Towsley, The Princeton Review editors cited his "ability to account for the varying levels of skill and understanding in his classes by trying to challenge those who already understand the material, while simultaneously being patient and supportive with those who feel they are lost." Join the conversation on SUNY Geneseo’s Facebook page. Why should I study math?